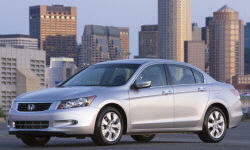 Honda Accord Handling Pros and Cons | Page 1 of 3 | Why Not This Car? Front heavy, but its a huge V6 so all and all pretty good. Multi-link suspension in the front gives decent front-wheel drive handling around corners. It's fine for the occasional squirt around the corner. It handles pretty good for having so much weight over the front end. When I push it the release is controlled and pretty neutral considering the weight on the front end. Not a bad family sedan. This car handles great. I have owned many sports cars and do not consider this a sports car but it is very sporty and handles very very well. It feels sluggish and not at all as nimble as one might expect, even though it has a 5-speed manual transmission. Feeling of confidence and stability on the highway. This car tracks true...no need to be constantly correcting. Tight handling. Double wishbone suspension is excellent on back roads. Stays planted, good center of the wheel feel. Very well controlled for a sedan. The suspension is firm without being punishing. Perfect for me.